The one thing I hate doing when i’m in a hurry is wasting time over tedious tasks that can easily be avoided. Take kabobs for instance. Do they look better when they’re perfectly shaped circles? Yes. Do they taste any different than if they weren’t? No. So when i’m a hurry, i’m obviously going to skip making sure each one is a perfect circle, or oval, or whatever shape they’re supposed to be. Let’s just say drop cookies have inspired me recently. 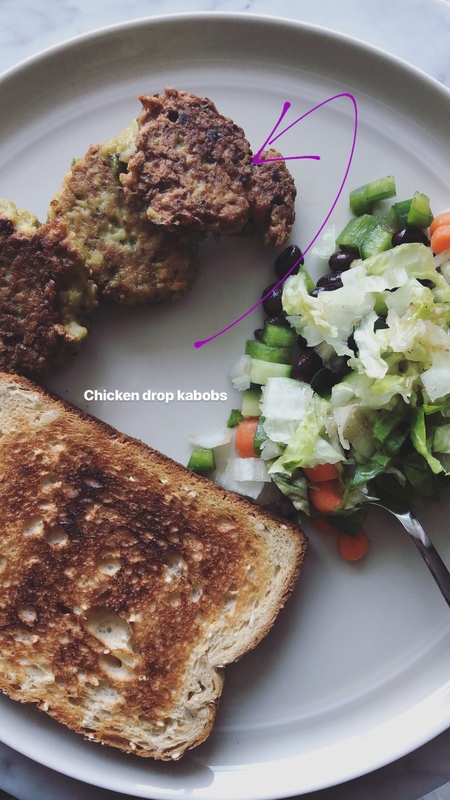 So behold, Chicken Drop Kabobs. These are great for meal planning. Make a batch on Sunday and eat them throughout the week, or freeze them in bulk and enjoy them at the press of a few microwave buttons. The recipe is full of fresh ingredients that will lighten up the whole mixture. See for yourself. If you have minced chicken then great, if not no need to worry. Just put boneless chicken pieces in the food processor with the rest of your ingredients. If you have a large enough food processor add all the ingredients and pulse till everything is mixed and chopped. If you have a smaller one start off with the coriander leaves, green chillies and onion and pulse till everything is finely chopped. Take it out in a bowl and mix in the rest of the ingredients together with a spoon. Refrigerate the mix for at least 30 minutes before frying. You can leave it overnight as well. To cook just heat 3 T oil in a frying pan and drop teaspoon fulls of the mix into the hot oil, not caring at all what shape they’ll turn out to be. The uneven edges actually make for a more crispy kabob, so you’re still winning. Cook the kabobs for 2-3 minutes on each side. If you’re worried they’re not completely cooked in the centre just pop them in the oven at 375 F for ten minutes and they’ll be done to perfection. You can keep these in the fridge and eat them just like that, or you can turn these into a chicken version of Dum Kabobs. These are perfect for mini chicken burgers too.